NATURE’s Humpback Whales follows these migrating marine mammals and presents their unique singing and hunting habits. These gentle giants are famous for their singing abilities — belting out seductive ballads to attract mates or to challenge other would-be suitors. But they also have other talents. Their unique hunting skill, called bubblenet feeding, involves a group of humpbacks working together to capture schools of herring. Each whale has a particular role in the process: One whale swims in a circle while blowing bubbles under a school of herring. When the bubbles rise, the school of herring can not escape and form into a tight ball in the center. Other whales vocalize — grunting or screaming — to scare the herring to the surface. 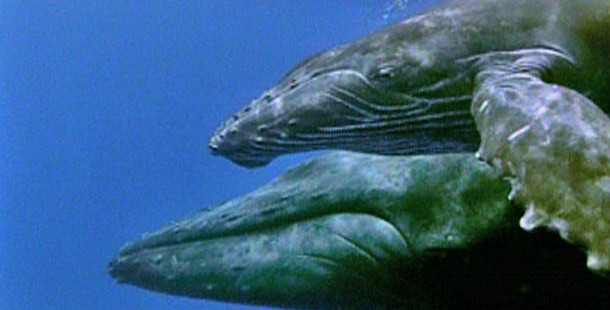 The whales then rise with their mouths wide open to capture large amounts of fish. Trek across the oceans with these astounding creatures and discover more revealing details about their wonder-filled, watery ways. A BBC Production in association with Thirteen/WNET New York. This program was produced by Thirteen/WNET, New York, which is solely responsible for its content.